That's how I knew Lily and I were cut from the same cloth. No, not this recipe. But Beyoncé. That Lemonade. Let me backtrack — I don't remember when or how Lily came into my life. But it made sense. We share the same circle of friends and have even lived in the same city (granted, at different times). So one day, out of the blue, we started texting: first to talk about shop, and then to talk about Beyoncé. When Lemonade came out, I was in a sad, isolated place. I was reluctantly spending the year in San Francisco, apart from Erlend and my friends in Portland. I struggled at my day job, and buried myself after hours in additional work for this blog. But Lemonade's message of regaining identity and female empowerment gave me hope and reassurance that, despite the rough patch I was currently in, things would eventually be okay. And texting and tweeting with Lily about our favorite songs from the album and about Beyoncé and all her fierceness was one of the lighthearted, bright spots in an otherwise quiet and lonely year. After Lemonade, the world marched forward. Lily and I kept in touch, but less about Beyoncé and more about our own lives. I moved to New York, and the weight I felt in San Francisco slowly lifted. Lily continued to work hard at her book, Kale & Caramel, which was released out into the wild at the start of the month. It's a gorgeous book — Lily has always been an extremely beautiful writer and photographer on her blog. On paper, her talents become even more pronounced. 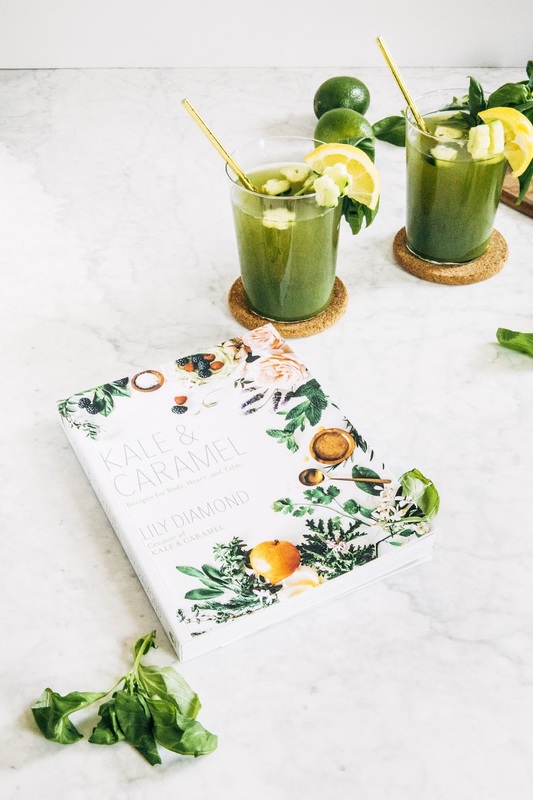 Each chapter is divided into fresh herbs and edible flowers, with culinary recipes, scrubs, and face masks dedicated to harnessing the power of the plants. 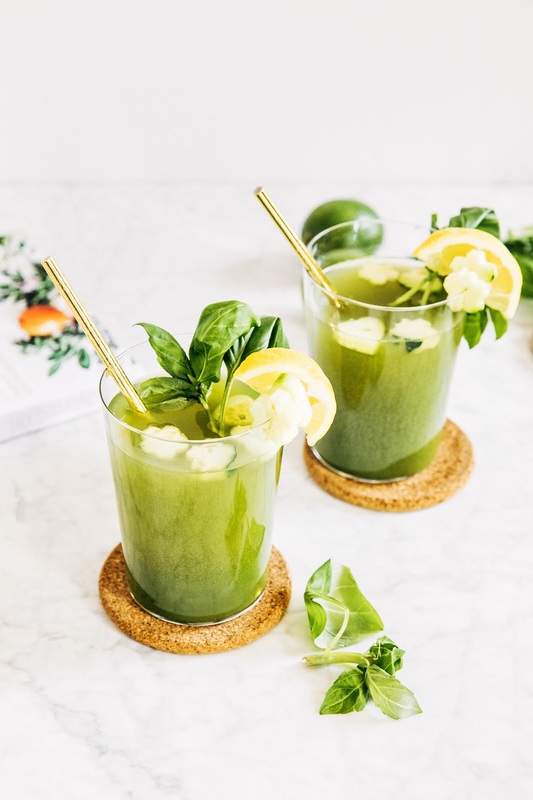 This sparkling cucumber basil lemonade is from the first chapter, "Basil", and to me, perfectly embodies Lily and her work: refreshing, sumptuous, and earthy, with a subtle dash of Beyoncé. 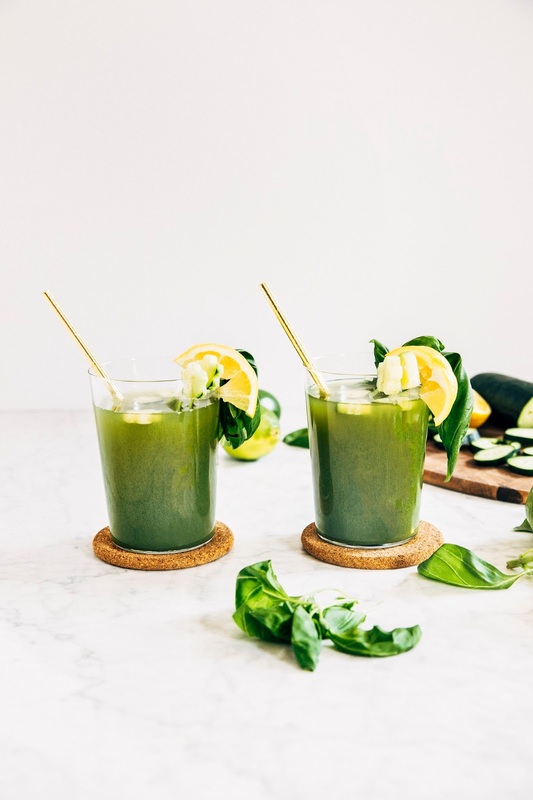 Because I used extremely fresh cucumbers and basil from Gotham Greens, it made an intensely flavored juice, similar to the fresh-pressed kind you can get at fancy juice places. I loved it. But if that's not your thing, you can more honey and sparkling water to your desired level of sweetness. 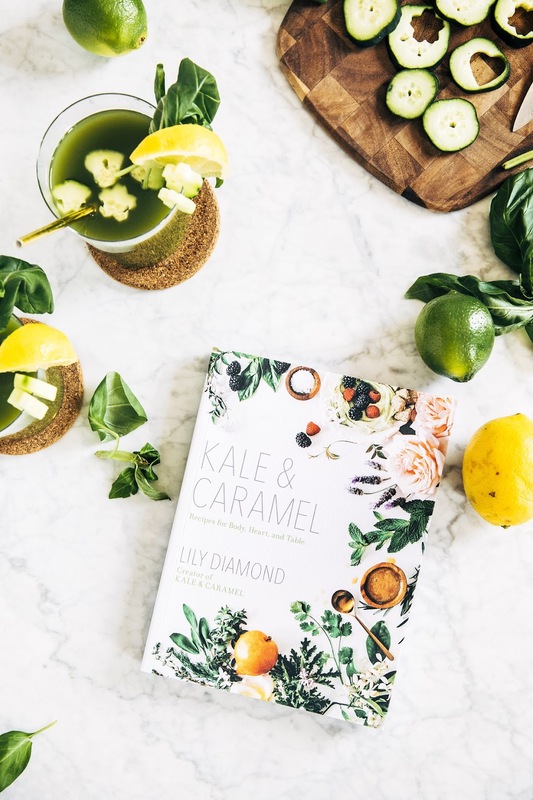 Lily notes that each drink recipe in her book translates well into a cocktail, including suggested alcohol pairings. 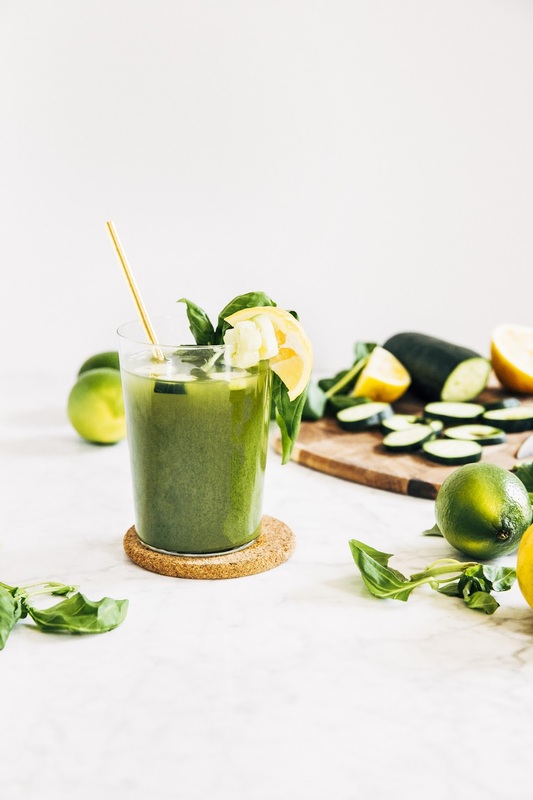 For this lemonade, she suggests pairing it with gin, vodka, light rum, or maybe even cachaça. 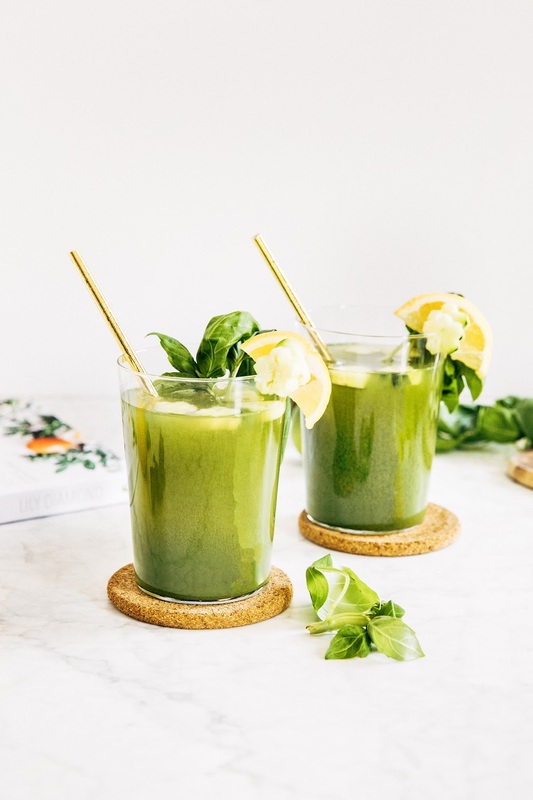 Add 1/3 cup coarsely chopped cucumber to a blender or a food processor with 2 to 3 fresh basil leaves, 1/4 cup fresh lemon juice, 1/4 cup still water, and 1 tablespoon honey. Use a blender or a food processor to blend until smooth, then distribute evenly between two glasses. Add 3/4 cup sparkling water, dividing evenly between the two glasses. Drop in a few ice cubes, and garnish with cucumber slices, lemon slices, and basil as desired. Enjoy!